Growing up in 17th century Sengoku era Japan, Shinmen Takezou is shunned by the local villagers as a devil child due to his wild and violent nature. Running away from home with a fellow boy at age 17, Takezou joins the Toyotomi army to fight the Tokugawa clan at the battle of Sekigahara. However, the Tokugawa win a crushing victory, leading to nearly three hundred years of Shogunate rule. Takezou and his friend manage to survive the battle, and afterwards swear to do great things with their lives. But after their paths separate, Takezou becomes a wanted criminal, and must change his name and his nature in order to escape an ignoble death. 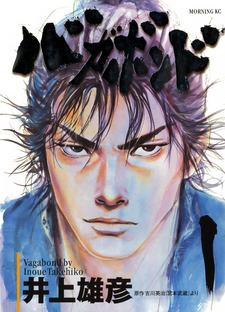 Based on the book "Musashi" by Eiji Yoshikawa, Vagabond is a fictional retelling of the life of Miyamoto Mushashi, often referred to as the "Sword Saint" - perhaps the most famous and successful of Japan's sword fighters.